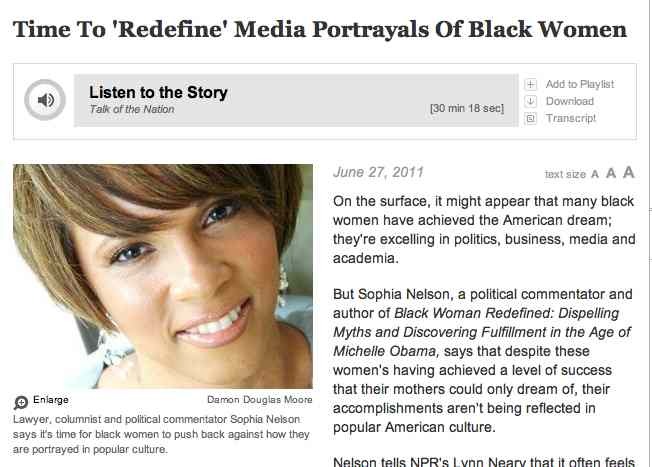 How appropriate to happen upon the interview on NPR today with Sophia Nelson about her new book, Black Woman Redefined: Dispelling Myths and Discovering Fulfillment in the Age of Michelle Obama. The interview was on Talk of the Nation with Lynn Neary. Just before the interview, I had a meeting with Rokeshia Ashley to discuss her McNair Scholar project. The McNair Scholar Program, created by the U.S. Department of Education, helps prepare students in under-represented groups to attend graduate school. Rokeshia and I have been meeting regularly since February to discuss research, and I’m always energized by her enthusiasm for learning and for helping make a difference for others, especially African-American teens. Today, I also received a postcard from Africa from former student Coleen Rowe, who while a student in class with me finally completed navigating the immigration process. She just graduated from UF and hopes to become an attorney to help others with their immigration efforts — or to help reform/improve the immigration process. Rokeshia and Coleen represent the talented, hard working and ambitious black women I work with. So Sophia Nelson’s views about how black women can be more successful professionally and personally are of interest to me in my teaching and mentoring. Black women typically receive a lower standard of treatment in business settings. Black women often rely on white women and men to serve as mentors to be successful in the work place — and that’s OK.
Black women also need a mentor from their own cultural group to validate their cultural identity and help them avoid simply assimilating into the majority culture. The system in place in this country — dating back to slavery and Jim Crowe — has promoted more advantages for whites than for blacks. As several of those calling into the show said and as did Sophia Nelson, we need more opportunities for public discussion of how to work through stereotypes and how to make diversity more than “window dressing” for businesses — or for higher education.